By cmooney on February 27, 2009. This I can only call a lie. A blatant one. Many of the column's incorrect factual assertions were challenged, and as Will is revisiting the column due to the response it has garnered, it's inconceivable that he doesn't know that. For God's sake, Will claimed that "according to the U.N. World Meteorological Organization, there has been no recorded global warming for more than a decade." That's false. And Will doesn't even address the issue at all in his latest column. It may well be that he is drawing inferences from data that most scientists reject -- so, you know, fine, I welcome anyone to make that point. But don't make it by suggesting that George Will shouldn't be allowed to make the contrary point. Debate him. There are many problems with this philosophy, but those are irrelevant, since George Will made factual errors rather than debatable inferences. Once again, he wrote that "according to the U.N. World Meteorological Organization, there has been no recorded global warming for more than a decade." There is no inference there. Will isn't saying he disagrees with the WMO's interpretation of the data, he's saying the WMO thinks there's been no recorded warming for more than a decade. The WMO doesn't think this. No serious scientific organization thinks this. It's a sad display from one of our great papers. The Post still has a lot of talented and hardworking writers; this is a slight to them all. In these difficult times, the paper ought to be striving to show it's still relevant. Instead, it shows us that at least at the editorial/oped page, they don't choose well between the truth on the one hand, and making such an eminence as George Will retract on the other. More from Carl Zimmer, Joe Romm, Media Matters, and many, many others. George Will: A Conservative "Intellectual"? Not. Lindzen stated that "there is no consensus, unanimous or otherwise, about long-term climate trends and what causes them" and "I cannot stress this enough -- we are not in a position to confidently attribute past climate change to carbon dioxide or to forecast what the climate will be in the future. That is to say, contrary to media impressions, agreement with the three basic statements tells us almost nothing relevant to policy discussions." "We're getting record highs, too. Australia, for example, recently experienced catastrophic forest fires, the worst in its history." Fires have little to do with record high temps and a LOT to do with poor forest/brush management. There have been MANY MORE record lows around the world than record highs in the last two years. "I can go on and on -- the evidence is vast." Please DO because most of the stuff you mentioned happened 5 to 10 years ago and is now REVERSING. Many glaciers are now GROWING again, snowfall is increasing again, etc. The climate is CHANGING BACK on its OWN without any reduction of CO2 by humans. BUT - the most important thing that alarmists HIDE from the discussion concerning glaciers is that they've been receding for HUNDEREDS of years! http://www.appinsys.com/GlobalWarming/GW_PART4_CLIMATICEVENTS_files/ima… These are just facts that you Al Gore sycophants cannot deal with and now nature is FINALLY driving a wooden stake through your silly notion that our MINESCULE addition of a MINOR greenhouse gas can somehow affect our climate in any significant way. You still haven't given any proof but I'll just keep coming back at you with SCIENTIFIC DATA that is 180 contrary to your entire scam. "Perhaps you are unaware of this, but Time Magazine is not considered to be a scientific journal." PERHAPS YOU ARE UNAWARE THAT THE UN IS A POLITICAL ORGANIZATION??? Goose- MEET GANDER! "You tacitly acknowledge my point that your scientific judgement is controlled by your political opinions, because you make no effort to defend yourself." I think intelligent people who read these posts can make up their own minds as to who is allowing their political persuasions to get in the way and who is offering scientific DATA to support their claims. $5 BILLION in federal programs and research grants are dished out, (wasted), every year to study "the problem". I'll bet my bottom dollar that almost anyone getting government money to study "the problem" is NOT going to EVER report that there really isn't a "problem" if that means they'll get no more funding next year. With global warming alarmism, politics has clearly overtaken true science. He should have held Will to the truth and thereby upheld his paper's standards. Newspapers don't have standards, they have balance sheets. If they had standards, most of the world's op-ed columnists would be out of a job. "But don't make it by suggesting that George Will shouldn't be allowed to make the contrary point." Hiatt's comment is absurd. George Will's column isn't a debating forum. He gets the first, the last and every other word in it. Even letters to the editor are sorted, filtered and selected by paper. Is nonsense going to be printed by the Post? That standard has to be set by the paper itself. When columns are easily shown to have easily refutable errors, Hiatt's reaction is that Will's opinion is as good as anyone else's (which, when it comes to facts, simply isn't true). A good question is, how did George Will get this kind of leverage vs. his editors? What if a liberal made claims so obviously false? I bet they'd be treated differently. Chris, I'm looking at page 4 of the "WMO statement on the status of the global climate in 2007", global temperature difference from 1961-2007. 1997-2007 was warm; a lot warmer than 1977-1997. But I bet if you fit a trend line to JUST that 10 years, it would be flat or decline slightly. I am not a climate scientist. I have no idea what the climate will do in the next ten years, and I agree that it is VERY misleading to pick a subset of some very complex data (with relatively large error bars) and then make some claims. But I wouldn't call Mr. Will a liar. Gavin Andresen: What are you possibly talking about? I'm looking at page 4 of the document you link to. It shows no such "flat or decline slightly". The small graphs, show highly variable temperature in the short term, but very obviously increasing trends. The text on page 4 directly contradicts Will's column. And the jumbo half-page multi-color graph on that same page is pretty damning as well, showing a clear trend towards increasing anomaly. "according to the U.N. World Meteorological Organization, there is a clear trend toward global warming for more than a decade, but I disagree with their conclusions." Will is lying. Its the only reasonable conclusion left. Jinchi, letters to the editor are not only sorted, they're sorted by Fred Hiatt. Let's not fool ourselves, while the Washington Post may have reasonably good news coverage, Fred Hiatt's editorial page has been a piece of GOP garbage for years. In a few months we'll be having the same discussion regarding a Post column on intelligent design, with Hiatt chiming in that it's all good because finally we're at least having a debate between the two sides. Will's columns are like theater or movie ads that selectively quote bad reviews: the NY Times or some prestige paper writes that a film is "so stunning in its stupidity, the only excitement in town is whether the comatose cameraman can keep in focus." So they take out ads in 400 newspapers that reads: "Stunning... the only excitement in town." I'm not sure the Post or its syndicate will ever take detailed criticism of Will's opinions on global warming (or anything else) very seriously, if only because those are all evidence that he is stirring up controversy, which is after all what he is paid to do and why they sell his column. And I'm pretty sure they'd run "Stunning...." movie and theater ads, so long as the checks cleared. For God's sake, Will claimed that "according to the U.N. World Meteorological Organization, there has been no recorded global warming for more than a decade." That's false. Well, it's true in the narrow sense that, according to the data I see displayed in the WMO document linked to above, 1998 was in fact hotter than any subsequent year, up through 2007. Certainly from 2001 on, it's not so easy to see a trend, I think, and indeed they all seem closely bunched together -- though perhaps it's too small a period in which to expect to see any real movement. Possibly Will may be making the argument that global warming, however caused, seems to have plateaued over the last decade or so. That's a little more complex a statement to shoot down. You'd really have to argue the point that, say, even though the years from 2001 on show no real trend and are closely bunched together, it can unquestionably be dismissed as statistically irrelevant. Surprise! George Will is skewing data to prop up one fraudulent tenet of an ideology that is awash in fraudulent tenets. The most insidious of them all is the twisted notion that unfettered laissez-faire capitalism and its "free market forces" is the best and only fair way to run an economy. All so-called "conservative" positions - I call them far right radical positions - flow from this colossal fraud. The Post will rigorously expunge falsehoods fron its pages, but will defend with equal rigor opinions that those same falsehoods are true. How could anyone see a contradiction in such an even-handed policy? It said that while global sea ice areas are "near or slightly lower than those observed in late 1979," sea ice area in the Northern Hemisphere is "almost one million sq. km below" the levels of late 1979. That's roughly the size of Texas and California combined. In my mind, it should have triggered a call for clarification to the center. George Will was entirely correct in his article. When people attack him directly it is called an Ad Hominem attack, on the person ("he is a liar"). Here is the truth about the climate. According to the United States National Climate Data Center temperatures in the Continental United States for 2008 were for most parts of the country below the 115 year temperature average. temperatures were rising in the late 20th century, 1998 was the second warmest year, yet every year since then has been cooling (there has been cooling for the last decade). According to the NASA Goddard Institure for Space Studies, one of the Federal Agencies that tracks global temperatures, global temperatures for 2008 were significantly cooler than 2007 and the coldest since 2000. 2008 global temperatures were also below the average of the last 30 years. (we only have 30 years of accurate satelite data). the Antarctic sea extent in January was 18% above the level in 1978, and at an all time record. There were one million square kilometers more ice than 30 years ago. It has been cooling in most areas of Antarctica the last 50 years. Proof of this is that sea ice extent only increases due to colder temperatures. Oh, by the way, there were three ice ages when CO2 levels were higher than today, once had levels twelve times higher. CO2 as a percentage of the atmosphere has grown 100 parts per million. So the increase is only 1/10,000th of the atmpsphere, this cant possible melt the worlds land based ice. There is a lot of lying going on, but its not George Will. For more fun facts take a look at this website. Pohanka: Nice try, but despite throwing up a linkstorm, you don't actually address the criticisms of Will's column or the Post's response. None of them. Your post might be interesting if we were discussing climate change, per se, but right now we're having a much more specific discussion about journalistic ethics. Do at least try to keep up, won't you? "George Will was entirely correct in his article. When people attack him directly it is called an Ad Hominem attack, on the person ("he is a liar")." I mean, that's not even frontal abuse of the English language; it's more like criminal neglect. Mr. Pohanka has now provided the blog with a textbook example of the Gish Gallop. For those folks who are unfamiliar with this tactic, it was invented by a Young Earth Creationist named Duane Gish, who actually had a PhD in chemistry from UC Berkeley and consists of throwing out numerous claims, mostly either taken out of context or outright lies purporting to prove his young earth anti-evolutionist assertions. At one time, he was known as a skilled debater until he had the misfortune to run up against the late biologist John Maynard Smith who positively devastated him in a debate held in Great Britain. Mr. Pohankas' web site, which his name linked to, doesn't identify him. However, anyone living in the Washington DC area is familiar with the name Pohanka, which is a family that owns a number of automobile dealerships in the area. And guess what, Mr. Pohanka is the president of the Pohanka Lexus auto dealership and a member of the Pohanka family that owns these dealerships. Nice try. Another Ad Hominem attack. What does it matter what my profession is. I am for clean energy, renewable energy, energy independence and higher gas mileage. The only thing I am opposed to is controlling CO2 since it there is not enough data to support that it controls the climate. No one disputed my facts so I suppose you chose to just attack me instead. Nice try. I think it will be a bad use of resoources to control CO2 when this money could be used for other worthy things. The fact that Antarctica recently had one million square kilometers more ice than 30 years ago, the most ice ever recorded, and that no one, not the media, not the global warming alarmists, want to say anything about Antarctica, speaks volumes. The entire Arctic sea ice could melt and sea levels wont rise an inch but if Antartica melts, with 90% of the worlds ice, now that would be a problem, but it is cooler there and there is more ice. This lack of responding to my questions, the Ad Hominem attacks, tells me that you have other goals in mind or seriously lack enough intellectual curiousity to find for yourself what the truth is. Maybe you will financially benefit from a carbon cap and trade scheme like Al Gore, but if I accuse you of that then I would just be falling into the gutter with you. If you post links to the Heartland Institute on Scienceblogs, prepare to not be taken seriously. The only way you can do worse, is to use Steve Milloy as a source. Actually, using Fred Singer as a source might be considered even worse then Milloy as the former is also on record as a denier of the cigarette/lung cancer and CFC/ozone depletion theories. Given Mr. Pohankas' claims, I can only presume that he has informed the Toyota and Honda automobile manufacturing companies, whose products are sold by Pohanka dealerships, that their advertising of the benefits of carbon reduction via hybrid vehicles are inaccurate and incorrect and that if they do not desist from such inaccurate advertising, his family will discontinue selling their products. I also presume, since the Pohanka family also has a Chevrolet dealership, that he will inform the General Motors Corporation that they will not carry the Volt if GM advertises it as a carbon reduction platform (assuming that GM remains in business long enough to begin selling the Volt). SLC | March 1, 2009 8:53 AM SAID: "Mr. Pohanka, as one whose family is heavily invested in the automotive dealership industry, thus has a vested interest in denying global warming as the automobile industry is one of the major contributors to the production of carbon dioxide and other carbon emissions." WOW! Let's all just ignore BILLIONS of forced taxpayer dollars wasted to make Maurice Strong happy by throttling the US economy to save Gaia and concentrate only on those wicked auto dealerships and their subversive agenda. Talk about rubbish subterfuge! Arctic sea coverage IS back to 1979/1980 levels according to satellite imaging - sorry, it's true. You'll also be chagrined to know that the rate of sea level rise, (it's been rising for over 8000 years didntyaknow), has started to decline, (again). 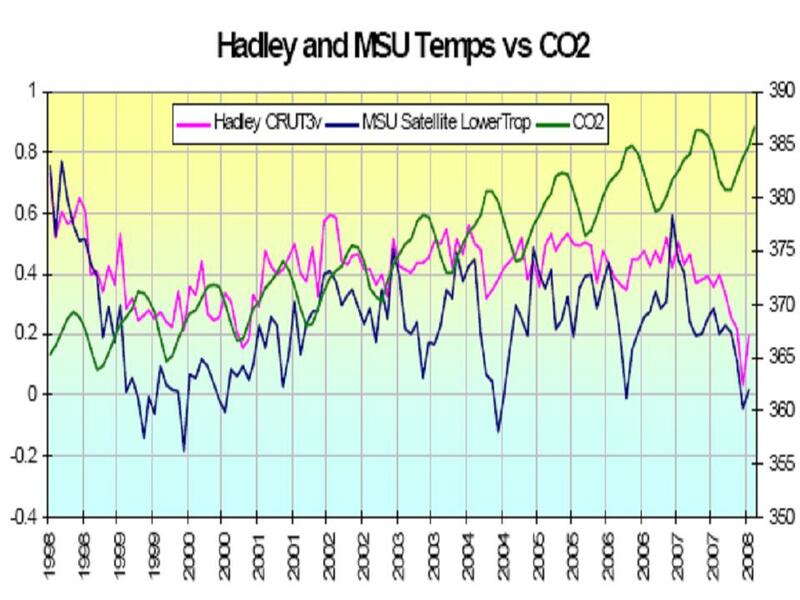 Not only that, MSU and Hadley Crut/v3 global temperature data have been underscoring the FAILURE of the flimsy IPCC and Jim Hansen climate models for the last 10 years. What part of the word 'wrong' is it that some people simply cannot understand? In REAL science, when data is discovered/presented that is contrary to a given theory, real scientists accept it whether they were championing the theory or not. In contrast, political pundits just keep denying the truth and whining. Let's see, hmmm, is the UN a scientific or a political organization? To date there remains no measurable scientific evidence that human CO2 emissions contribute to global warming but an ever-growing mountain of data to suggest that, even if there actually was some tiny truth to AGW under there somewhere - it ain't worth worrying about; not even one gallon of Jet A in Al Gore's private jet's worth. PER NOAA "El NiÃ±o/Southern Oscillation (ENSO) is the most important coupled ocean-atmosphere phenomenon to cause global climate variability on interannual time scales." Mike M, let me explain why you're mistaken. First, on the matter of Arctic sea ice, you have to take into account the seasonal changes. Arctic sea ice reaches its minimum in September, at the end of summer; it then increases in the winter because it's colder during the winter. So if you want to compare one year with the next, you need to compare the Arctic sea ice extent AT THE SAME TIMES OF THE YEAR. Your comparison fails on this point. Second, as people have written thousands of times, weather is not climate. The change from one year to the next is not significant; climate data doesn't mean much until you have a good 30 years of coverage. Arguing about whether it got hotter from 2005 to 2006 is irrelevant to the issue of climate change. Thus, the graph you link to showing cyclone energy should best be fitted with a straight line. That is, we carry out a simple least-squares fit of the data to a line. And when you do that, you'll get a line that slopes UPWARD -- meaning that the data you link to clearly shows cyclone energy INCREASING with time. You just need to be able to read the data. This simply isn't true. It has long since been proven in the lab that CO2 causes a greenhouse effect. And we know of a certainty that CO2 emissions are increasing, and CO2 concentrations in the atmosphere are increasing. And lastly, we have abundant evidence from many sources that temperatures in many places of the globe, but most especially at the poles, are increasing rapidly. Ice volumes are the best indicator, and the data here shows diminishing ice volumes at both poles. I didn't notice Mr. Pohanka's post earlier, so I'd like to explain his mistakes. Most of them fall into the "weather is not climate" class. There's gigabytes worth of weather data out there, and anybody can cherry-pick a little bit of it to prove that temperature has gone up, gone down, or stayed the same. That's why we have to look at the big picture, not this month's temperatures. Another of Mr. Pohanka's errors arises from confusion between sea ice extent and total volume of sea ice. Sea ice extent -- the area of sea covered by ice -- is a weak proxy for the amount of ice. We have to remember to think in three dimensions here: there's depth as well as area. And much of the sea ice we're seeing is thinner than in past times. This is indicated by the rapidity with which it breaks up in the summer. Moreover, as Mr. Pohanka has pointed out, it's the ice on land that really matters: the ice on Antarctica and on Greenland. And that ice is melting, as is demonstrated by the acceleration of glacial movement at the coasts of both lands. Anyway, I'll be happy to explain any of this science to either Mr. Pohanka or Mike M. There's no need for vituperation here; it's just a matter of explaining the science. Wrong. You are struggling to hang on to failed predictions. You are alluding to false determinants and making misleading claims. 1. http://wattsupwiththat.com/2009/02/27/george-wills-battle-with-hotheade… The Arctic ice extent comparison is VALID "According to the University of Illinois Arctic Climate Research Center, global sea ice levels now equal those of 1979. " You want to argue with their results - be my guest. 2. "weather is not climate." The Al Gore alarmism was originally based on a warming cycle less than 15 years running at the time. Dr. Claude Allegre, one of the people Al Gore first quoted as an expert who believed humans 'might be' causing global warming -- has since REVERSED his opinion! (but you'll never hear Al Gore mention his name ever again..). The cooling period in the 50's 60's led to cooling alarmism. The planet has been in a slight cooling trend since 2001 and we remain cooler than 1998. But you want to stretch the goalposts whenever the data doesn't appear to be leaning toward your scam. One cold or warm year doesn't mean much but ten is PLENTY to show that the IPCC and James Hansen model projections are WRONG by the simple fact that that was indeed within the target period of their projections. You can't have it both ways! Additionally, only a fool would not recognize that repeatedly breaking low temperature records, (and record low high temps, etc), for the last couple years is simply NOT consistent with 'global warming'! 3. "best be fitted with a straight line" There is ZERO reason to use least squares fit for the cyclone energy data. 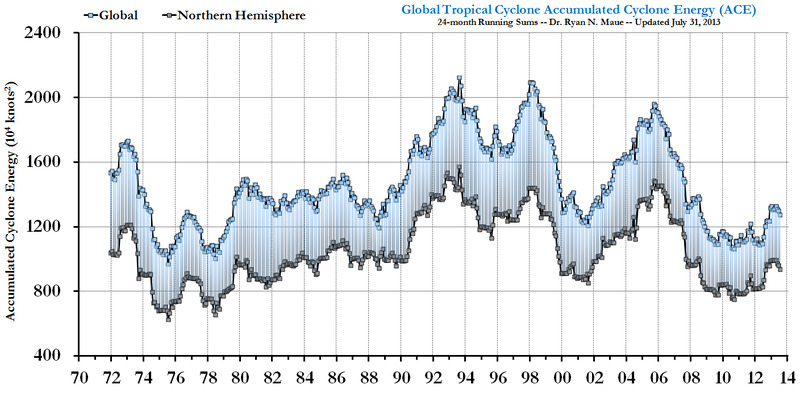 Cyclone energy has been around for a lot longer than the earliest date on that chart. Using linear regression allows you to cherry pick the dates, draw your precious straight lines and say the trend is 'X' no matter what the actual trend might really be. The trend now is clearly NEGATIVE and a 3rd order analysis would show that the rate of decline is increasing as well - but nobody needs even that because you can see it directly by eye. Beyond that, clearly the cycle is on the order of 4 to 8 years so a linear regression over 30 years just totally squelches the cyclic nature of the data as much as it ignores everything that happened for eons before ~1970. But none of that is even the point - the FACT remains that the energy has DROPPED back to where it was in the late 70's and that was unexpected.... UNPREDICTED. How could it do that if your claim of CO2 causing global warming was true? By that chart, the energy dropped more than 100 points on 11 occasions while CO2 just steadily increased. If CO2 drives climate as you claim - how did it ever come down at all? 4. "CO2 emissions are increasing" As they have many times before and sometimes to MUCH higher levels than now long before humans ever walked the earth. Vostok ice core samples show that warming always precedes CO2 increases by several years. It's doing that again and our TINY addition is like spitting in the ocean. "proven in the lab that CO2 causes a greenhouse effect" - so what? How much of an affect it has is totally THEORY - no one actually knows. Water vapor is over 90% of the planet's "greenhouse effect" going by accepted science but again - the overall planetary water vapor cycle is far too complex to say that it is completely understood AND EVEN THE IPCC SUMMARY ADMITTED THAT! You do not? QUOTE from AR4, Chapter 8, page 600 - "Models continue to have significant limitations, such as in their representation of clouds, which lead to uncertainties in the magnitude and timing, as well as regional details, of predicted climate change." The fact is that the ocean and the sun, taken together, are firmly in control of earth's climate. CO2 is a virtual NON-ISSUE in comparison and it there is no just correlation to show that rising CO2 causes temperature rise. 1. You present a quote: "According to the University of Illinois Arctic Climate Research Center, global sea ice levels now equal those of 1979. " That quote is from Mr. Will's column, not from the Illinois Arctic Climate Research Center. In response to Mr. Will's claim, the Arctic Climate Research Center posted a statement (which has since been removed without explanation) saying that they had no idea where Mr. Will got that idea. If you have any basis for supporting Mr. Will's claim, I'd love to see it. When I examine the data graphs presented at the website, I see a great deal of information flatly contradicting Mr. Will's claim and nothing supporting it. 2. "The Al Gore alarmism was originally based on a warming cycle less than 15 years running at the time." I think you're fabricating that claim. I challenge you to substantiate it. My own experience over the last 30 years is that most scientists did not become convinced until there was substantial data covering more than a century. "The cooling period in the 50's 60's led to cooling alarmism." There never was any 'cooling alarmism' in the scientific community. I challenge you to provide evidence to the contrary. "The planet has been in a slight cooling trend since 2001 and we remain cooler than 1998." Again, weather is not climate. A trend over 8 years is too tiny to be significant. It's a fluctuation, not a tend. "But you want to stretch the goalposts whenever the data doesn't appear to be leaning toward your scam." On the contrary, I am consistent in maintaining that temperature trends should be analyzed with a smoothing window of maybe 30 years. Do you accept such an averaging window size?
" One cold or warm year doesn't mean much but ten is PLENTY" No, ten years is not a sufficient period of time to establish a trend in temperature. Remember, if you increased radiative input from the sun by 10%, it would take about 40 years (first order calculation) for the earth's oceans to heat up by 1 degree Kelvin. We're talking about much weaker effects and you think it they'll show up in a mere ten years? C'mon --- think in terms of heat capacity! 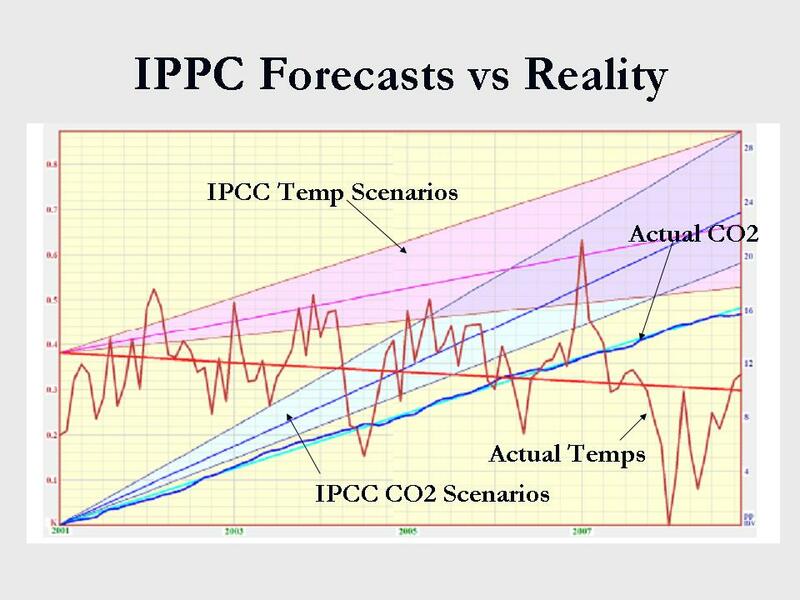 "the IPCC and James Hansen model projections are WRONG by the simple fact that that was indeed within the target period of their projections." Perhaps you should re-read the IPCC projections, which talk about increases in temperatures over the next century -- not the next few years.
" only a fool would not recognize that repeatedly breaking low temperature records, (and record low high temps, etc), for the last couple years is simply NOT consistent with 'global warming'!" Record low temperatures? And what about the record high temperatures? You want to simply ignore them? Cherry-picking your data is dishonest. 3. "Using linear regression allows you to cherry pick the dates," No. You use ALL the data. That means that you're not cherry-picking at all: you're using ALL the data. "The trend now is clearly NEGATIVE and a 3rd order analysis would show that the rate of decline is increasing as well" I suspect that you may not be familiar with statistical analysis of physical data. You are slinging around some terminology in ways that make no sense. You talk about a "3rd order analysis" -- do you mean using a 3rd order polynomial? If so, on what basis do you claim that a 3rd order polynomial is superior to a line? Is there some physical law you are invoking to justify use of a 3rd order polynomial? Or are you instead invoking a 3rd order polynomial as another form of cherry picking? Do you pick your functions as facilely as you pick your data? Please provide a justification for preferring a 3rd order polynomial over a line. "eyond that, clearly the cycle is on the order of 4 to 8 years so a linear regression over 30 years just totally squelches the cyclic nature of the data as much as it ignores everything that happened for eons before ~1970." And on what physical basis do you support your claim of a cycle of 4 to 8 years? I suggest that you are confusing random fluctuations with physical effects. Can you provide any scientific basis for your perceived cycle? Or are you just making it up? Let me expand on this because it is apparent that you don't understand how to analyze scientific data. Data series for complex phenomena show all sorts of oddities. The data will wiggle around for a while, and then the wiggling will simply disappear for no apparent reason. That's because the cycles people see in the data aren't real -- they're just part of the complexity. People really learned this the hard way in the 60s and 70s when they started doing all sorts of complicated mathematical analyses of the stock market. They'd find some fluctuation, call it a cycle, and then make investments based on their projections of the cycle -- and lose their shirts! Simply eyeballing a data series and declaring the existence of cycles and trends never works UNLESS there is some underlying physical reason for such behavior. If you don't have a solid physical reason for a certain class of behavior, seeing cycles and trends is just numerology. We DO have a solid physical reason for looking for linear changes in temperatures. We DON'T have any physical basis for assuming any other functional fit. "the FACT remains that the energy has DROPPED back to where it was in the late 70's and that was unexpected.... UNPREDICTED." No, there is no such fact. The graph on which you base your statement uses 24 month running sums. Do you know what that means? Can you explain why a 24 month running sum is superior to a 240 month running sum? If not, then you don't understand what that graph means and you don't understand what the "FACTS" are.
" If CO2 drives climate as you claim - how did it ever come down at all?" For the umpteenth time, weather is not climate. The fact that in Budapest, Hungary, it's colder now than it was 20 minutes ago doesn't prove that the earth is cooling. You have to look at the big picture, not little bits and pieces of data. You have to look at ALL the data. "Vostok ice core samples show that warming always precedes CO2 increases by several years. It's doing that again and our TINY addition is like spitting in the ocean." Oh lordy, lordy, you're repeating this mistake. Increasing temperatures cause carbon dioxide frozen in permafrost to be released into the atmosphere. In other words, increasing temperatures cause CO2 concentrations to rise. Thus, CO2 concentrations follow temperature increases. BUT they also lead temperature increases: more CO2 in the atmosphere causes a larger greenhouse effect, which increases temperatures. This is called a "vicious circle". The existence of half of the vicious circle does not argue against the other half of the vicious circle. For example, we know that rising unemployment causes more people to miss their mortgage payments, which causes some banks to fail, which causes some businesses to fail, which causes more unemployment -- but you're arguing that, since the original unemployment preceded the business failures, business failures cannot possibly be the cause of unemployment. Right. "our TINY addition is like spitting in the ocean." Our tiny addition has increased CO2 concentrations from 280 ppm to 387 ppm in the last 150 years. That's either a very big spit or a very small ocean. "the overall planetary water vapor cycle is far too complex to say that it is completely understood AND EVEN THE IPCC SUMMARY ADMITTED THAT! You do not?" We do not completely understand what happens inside a nuclear bomb. So the people of Hiroshima are just psychosomatics, right? You don't need omniscience to get usable science. Indeed so. And how big are those uncertainties? Did you read that part, too? "The fact is that the ocean and the sun, taken together, are firmly in control of earth's climate." And you're certain that they are the only possible factors at work here? You're certain that CO2 has zero effect on climate? "CO2 is a virtual NON-ISSUE in comparison and it there is no just correlation to show that rising CO2 causes temperature rise." I take it, then, that you're not familiar with the physics of radiative absorption and emission. Because the physics of radiative emission and absorption is very solid and well-established. Or are you saying that the physicists are wrong about this, too? ok everyone, here is the bottom line about global warming, or lack there of. 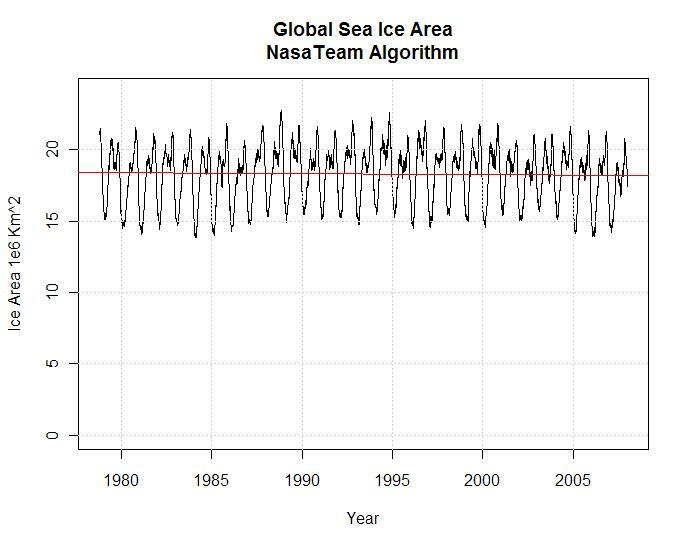 Here is the NASA chart that shows total sea ice area since 1979. Show me all the ice melting that they say is going on, the 30 year trend shows little deviation, as one pole melts the other ices over, every year. Very little deviation. From the press you think it would have been cut in half. If that is not enough, here is another one. Sea temperature is very important in driving weather. NASA says that the oceans are now entering a 30 year cooling phase, this started in 2003. Take a look at this weeks sea temperatures, they are cooling big time!!!! !Lower sea temperature will cause overall temperatures to drop worldwide and there will be more polar ice, not less. Ok. so that's not enough data either. No ice melting, oceans are cooling. Hey, look when temperatures rose mysteriously, when 50% of the earths weather stations either stopped reporting or the data stopped being collected, around the time of the soviet union. See any connection between temperature increase and data collection here??? So the data that shows land temperatures rising is corrupted. Ok, you still are not convinced. Did you know that CO2 by itself can only raise temperatures 1.2C. and that this already happened. You can double, tripple, CO2 and it can not raise temperatures by itself, it must trigger other feedbacks, such as cloud formation, but there is no proof of this happening, in fact, if it warms, there is less cloud formation, not more, clouds become a negative feedback and make it cooler. and finally, if that is not the knockout blow. CO2 makes up only 3% of all greenhouse gases (water vapor in 95% of greenhouse gases), and man only contributes 3% of the CO2 into the atmosphere every year, (the rest is from natural sources). So man only contributes .117% of all greenhouse gases into the atmosphere every year!!!! And they say this little amount will melt the poles! CO2 increases as a percent of the atmosphere since 1750 is only 1/10,000th! I doubt Mike M will engage you further. An MS in meteorology from Florida State leaves one rather unprepared to debate at this level. Whoa! Are you saying that Mike M has an MS in meteorology? I find that very difficult to believe. He completely screwed up the analysis of the cyclone energy data. I had him figured for somebody who had taken an elementary meteorology course in college twenty years ago. Erasmussimo said: "I take it, then, that you're not familiar with the physics of radiative absorption and emission. Because the physics of radiative emission and absorption is very solid and well-established. Or are you saying that the physicists are wrong about this, too?" This is the common subterfuge I always get when I set environitwits back on their heels. I am familiar with the physics, (nowhere near as much as say Dr. Richard Lidzen!) but no one, I repeat NO ONE is arguing against physics at all! Show me ONE physics equation that proves CO2 causes global warming? There AREN'T ANY! Erasmussimo said: "You're certain that CO2 has zero effect on climate?" I never said that - I said it was insignificant and the UAH MSU temperature record from the last ten years proves that IF it is doing anything it is too small to notice. Where's the correlation we were promised by the Hansen models? http://icecap.us/images/uploads/MonthlyCO2vsTemps.jpg Hmmm? The difference in correlation on those two charts is a plain as day! I predict we are going to get a LOT cooler over at least the next 5 years. Meanwhile Obama is going to DOUBLE the cost of almost everything because almost everything is affected by the cost of energy, (ie raise taxes), with his socialist money grab in the name of limiting carbon dioxide which has never been proven to to significantly affect the climate. The total cost was estimated as high as $4 trillion!! It's all a SCAM to grab money. What you FAIL to mention is that all of this alarmism began only about 20 years ago! The last 8 of those years have NOT been warming leaving only TWELVE years of warming for you shout this nonsense. Just before that - it was the global COOLING scare, (I was here then). Same MO, same players, (anti-nuke union of concerned scientists, UN sychophants, etc.) - with no real PROOF. So NOOOOO! You do NOT get a century - you get about FOUR MORE YEARS by my figuring to HOPE that the climate starts rapidly warming again, FOUR more years to hope that sea level rise accelerates to 'Gore proportions' causing "mass migrations" as you said it would. After that - YOU LOSE, go away; take the snake oil with you and leave the rest of us alone! The climate has ALWAYS changed; it has changed WAY more than anything seen in the last couple centuries and it will continue to change no matter what we do. Termites emit more greenhouse gas than humans - let's just kill them? Ok? By the way, I'm a mechanical engineer if anyone needs to know. I'm an automatic machine designer and have a lot of experience in control systems and SPC. Show me ONE physics equation that proves CO2 causes global warming? There AREN'T ANY! It's called the Stefan-Boltzmann equation. It specifies radiative transfer of black bodies. When you combine this with the absorption spectrum for CO2, you get -- drumroll -- global warming! The basic physics is often taught in lower division physics courses. The statement you made would earn you an F on a test in one of these courses. The ONLY thing being foisted on the American public is this notion that computer models written by mostly government HACKS like James Hansen or HACKS in political organizations like the UN, should be accepted without question. I challenge you to provide a specific criticism of a specific model. Obviously, you wouldn't criticize such models without being familiar with them. So please, show me the element of the model, the equation, approximation, or numeric value that you find objectionable, and the reason why you find it flawed. Ah, the ubiquitous "weather is not climate" mistake. It seems that AGW deniers will NEVER understand the difference between weather and climate. There is no such thing as "the current climate" because climate is measured over multiple decades, not years. Expecting a model to predict "the current climate" is rather like complaining that there's no point in having economic policy because we cannot measure "the current American economy" for any particular hour. Weather is not climate. You must write that 100 times on the chalkboard after school. Oh, dear, very bad step on your part. Apply the Stefan-Boltzmann equation to the sun-earth system and you'll realize that the data you provide suggests that the sun is not driving the earth's temperature. Looks to me like your political opinions are driving your scientific opinions. Me, I rely on science to drive my scientific judgements. It's pretty obvious that you settled on a political stance and now twist the science around to fit your politics. Yep. Back in the 1960s and 1970s, we all knew that global warming should be taking place (those physics equations -- the ones that you claim don't exist -- showed quite clearly that global warming from CO2 should start taking place soon. However, being wild-eyed alarmists, scientists never said anything about it publicly because there was no empirical evidence to support it. When Mr. Hansen began sounding the alarm twenty years ago, most scientists took a wait-and-see attitude. As the evidence in favor of the AGW hypothesis mounted year after year, and no substantial evidence against it appeared, more and more scientists decided in favor of the hypothesis. Now, after twenty years of accumulated detailed evidence, the great majority of scientists support it. They sure did fly off the handle, didn't they? Again, weather is not climate. But no, you don't have to wait one single minute to discover that this is all quite real. You see, if you're equipped with an understanding of the science behind all this, you'd be able to examine all the data and see that global warming is in fact already happening on quite a large scale. But of course, somebody who doesn't even know about the Stefan-Boltzmann equation (which is to climatology as the law of supply and demand is to economics) will just have to watch his thermometer for the next few decades -- by which time it will be too late. and that is the consensus of NON-government scientists who are NOT sucking at the trough of $5 BILLION in government funding. Oh, really? Are you prepared to substantiate that claim? I know exactly where this line of argument goes -- you don't want to walk down this path. Just before that - it was the global COOLING scare, (I was here then). Same MO, same players, (anti-nuke union of concerned scientists, UN sychophants, etc.) - with no real PROOF. Oh my, I didn't think you'd make a mistake THAT bad. This matter has been much investigated and completely debunked. I'd be happy to provide you with a link, but I doubt that you're actually interested. But since you were there, I ask you to scan your memory and tell me WHERE you read about global cooling. I think you'd better stay after school and write "Weather is not climate" an extra 100 times. After that - YOU LOSE, go away; take the snake oil with you and leave the rest of us alone! Fortunately, you are already in the minority on this point; you have already lost the scientific battle and now you are losing the political battle. And when we start the political debate on the details of how to respond to it, most people will write off the deniers as nutcases undeserving of a serious hearing. Which means that the debate will be dominated by the reality-based people. There's a lesson here: the way to win in politics is NOT to take the most extreme position in the hope that people will meet you halfway. The way to win is to take the BEST position so that you have credibility. Loudly mouthing the same old falsehoods just doesn't work with an educated electorate. That would work, but it would be extremely expensive, much more expensive than the other options available to us. Besides, termites have a nasty way of regenerating after you've killed a bunch of them. We'd be spending our entire GDP on bug spray. "When you combine this with the absorption spectrum for CO2, you get -- drumroll -- global warming! " I SAID- SHOW ME AN EQUATION THAT PROVES GLOBAL WARMING. (All you did is repeat your prior post and the same idiotic ad hominems). You cannot! It does not exist! You can't use ONLY CO2 to predict climate change. Firstly, there's water involving evaporation/condensation specific heat convective transport to upper atmosphere, cloud reflection, ice reflection, ocean currents. Your Stefan-Boltzmann equation has NOTHING to do with those! Then there are little things like plants growing more quickly with more CO2 thus SOAKING UP sun UV radiation more quickly (= less UV ending up as IR heating) Your Stefan-Boltzmann equation has NOTHING to do with that either! Then there's the SUN which VARIES in output - again, your Stefan-Boltzmann equation does NOTHING to accommodate that variable. Shall I go on flogging you with the reality that your precious Stefan-Boltzmann equation is MEANINGLESS by itself in regard to climate?
" ...see that global warming is in fact already happening on quite a large scale."WHERE? You still haven't shown that to be true in the last ten years! "Looks to me like your political opinions are driving your scientific opinions." Exactly 180 - quote by MAURICE STRONG: âIsn't the only hope for the planet that the industrialized civilizations collapse? Isn't it our responsibility to bring that about?â Quote by Paul Ehrlich, professor, Stanford University: âGiving society cheap, abundant energy would be the equivalent of giving an idiot child a machine gun.â Quote by Robert Muller, UN Assistant Secretary General: âIn my view, after fifty years of service in the United National system, I perceive the utmost urgency and absolute necessity for proper Earth government. There is no shadow of a doubt that the present political and economic systems are no longer appropriate and will lead to the end of life evolution on this planet. We must therefore absolutely and urgently look for new ways.â Quote by Emma Brindal, a climate justice campaigner coordinator for Friends of the Earth: âA climate change response must have at its heart a redistribution of wealth and resources.â (I've dozens of those) Global Warming Alarmism is BASED ON A POLITICAL AGENDA NOT SCIENCE. "I think you'd better stay after school and write "Weather is not climate" an extra 100 times." No - you had better tell that to AL GORE because the alarmist model predictions were only based on a few years of prediction. 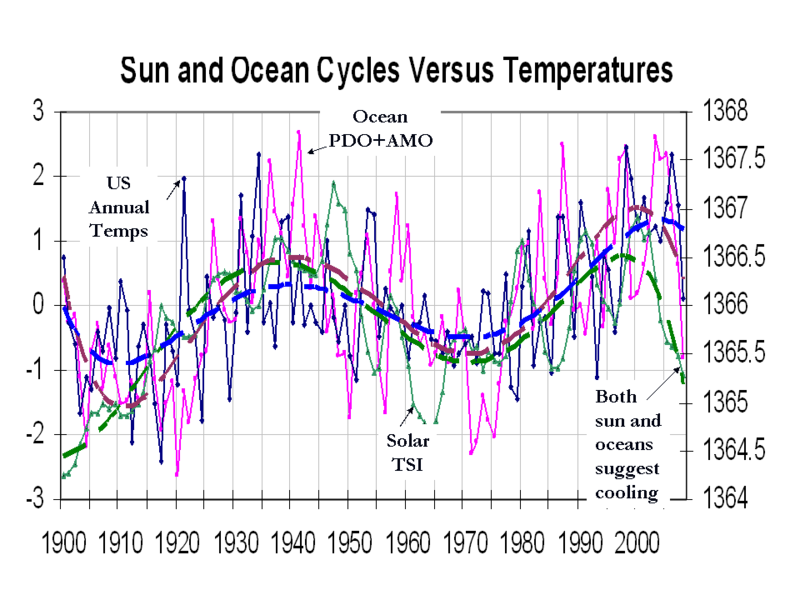 WHERE is the Medieval Warming Period in Al's charts? He conveniently keeps THAT out of consideration. 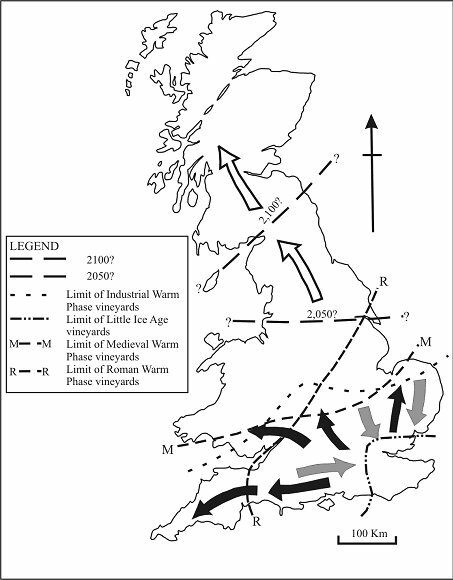 It WAS warmer then, (Gee, where did all those 'vineyard' sounding names in England come from?) and there are proxies from all over the WORLD to prove that is was NOT just in Europe as lame Gore-bots tried spin it. The only reason there is more written about the warming in Europe then is SIMPLE - they were the most LITERATE (% overall population) back then..
"You can't use ONLY the law of supply and demand to predict the how the economy behaves. Firstly, there's the transaction costs that act as friction in an economy, transportation costs, energy costs, the costs of training new employees. Your law of supply and demand has NOTHING to do with those! Then there are little things like government regulation thus SOAKING UP company profits more quickly. Your law of supply and demand has NOTHING to do with that either! Then there's the weather which VARIES in temperature - again, your law of supply and demand does NOTHING to accommodate that variable. Shall I go on flogging you with the reality that your precious law of supply and demand is MEANINGLESS by itself in regard to the economy?" The basic concept here is that in science, we think in terms of "first-order causal factors", "second-order causal factors", and so forth. The first order factors dominate the system, and so you start with the first-order factors. The stuff you're talking about is second or even third order. It deserves consideration, but the starting point is the Stefan-Boltzmann equation. You' can't see the forest for the bark. You know, if you look in the wrong place, you'll probably get the wrong answer. Your back yard isn't the globe. On my land, the die-off of Douglas Firs is well underway. But I'm not so foolish as to extrapolate from my location to the whole world. getting record low temperatures all over the world is somehow consistent with a warming planet? We're getting record highs, too. Australia, for example, recently experienced catastrophic forest fires, the worst in its history. A prudent scientist would not draw any conclusions from so tiny a data point. We have to look at ALL the data -- as I've already written several times. And when we look at ALL the data, the evidence for AGW is overwhelming. I asked you to provide a specific criticism of a specific model and you cannot. Instead, you criticise what you think to be the results of the models -- and your interpretation is founded on the failure to understand the difference between climate and weather. You don't have a cogent criticism of the models. You tacitly acknowledge my point that your scientific judgement is controlled by your political opinions, because you make no effort to defend yourself. Instead, you point to a variety of people who also allow their scientific judgements to be influenced by their political opinions. If you want to put yourself in the same category with them, that's fine with me, but don't you think you'd have more credibility if you were keeping your politics separated from the science and just talking about the merits of the science? That's what the NAS and all the other scientific institutions that endorse the AGW hypothesis are doing -- that's why they have credibility. Next, you cite Time Magazine as the proof that scientists were warning us about global cooling. Perhaps you are unaware of this, but Time Magazine is not considered to be a scientific journal. The depth of its scientific reporting may be adequate to your own needs, but scientists themselves never read Time Magazine for their scientific information. They instead prefer to use a special class of literature known as "scientific journals" which rely on a complicated and lengthy process to insure that their contents are scientifically justifiable. And if you read the relevant scientific journals from the 1970s, what you'll find is a few papers suggesting the remote possibility of global cooling, and a good many more papers discussing the greater possibility of global warming. If you read the National Academy of Sciences 1975 report on the climate issues, you'll discover that this, the most prestigious organ of scientific judgement, declared that we simply didn't know enough about climatology back then to draw any reliable conclusions. These days, the NAS is now declaring that we do have enough data to draw conclusions, and that conclusion is that the AGW hypothesis is correct. You seem quite concerned about Al Gore. Tell me, what scientific papers has he published? Is he one of the authors of the IPCC reports? Is he a member of the National Academy of Sciences? If not, then why are you wasting time talking about the opinions of somebody who is not part of the scientific discussion? Would it be appropriate for me to quote Rush Limbaugh as a representative of the opposition to AGW? Oh, and on English vineyards -- they're still there. I stayed at a B&B at a vineyard just north of Glastonbury some years ago. You seem to prefer spending more money on bug spray than other solutions would cost. That doesn't seem very economical to me. Lastly, let me point out the obvious fact that you're very emotionally involved in this. Emotionalism is never very effective in dealing with problems, and it is completely inappropriate in dealing with scientific problems. Our body politic needs to consider this problem logically, not emotionally. After all, science is fundamental a rational pursuit, not an emotional pursuit. I urge rationalism upon you.